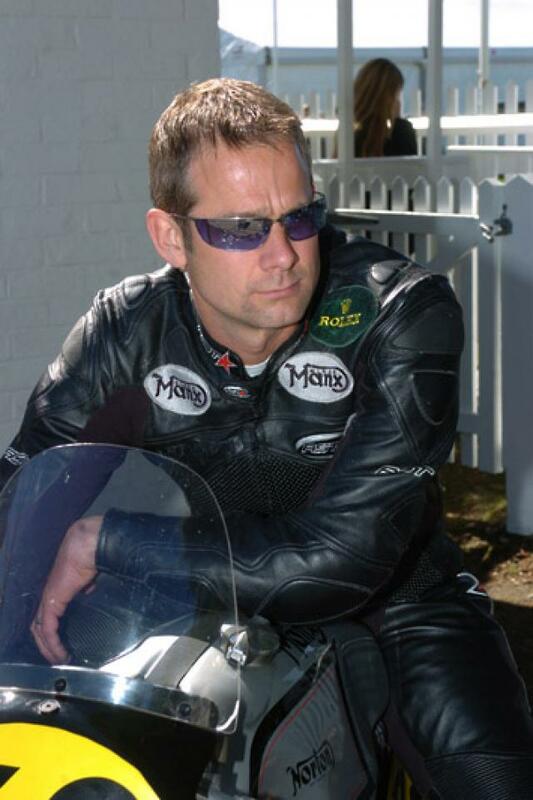 Mr James Whitham and Mr Niall Mackenzie are down in the country for the weekend. It's going to be a topping few days of sport as our two heroes tear around the track on their fine machines, filling the air with an aroma of hot oil and warm rubber. The sun is shining across the Sussex downs, and all around chaps with spanners poking out of their back pockets are fettling racing machines. Mr Mackenzie has brought his man, Mr 'Diddy' Daryll Young, to fetch refreshing drinks and to prepare leathers, fettle riding equipment and generally to look after his master's needs. Plea_se, ladies and gentlemen, wind your timepieces back to the 1940s and join Visordown from the Goodwood Revival. It's going to be a weekend of dashing gents and glamorous fillies, of fantastic machinery with two and four wheels - and even a few with wings and propellers. 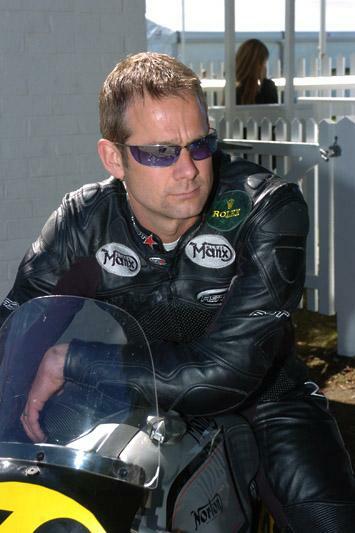 Mr Whitham is no stranger to Goodwood, for it was only this summer that our great friend made a complete dumpling of himself at the Festival of Speed with a dramatic misjudgement that resulted in the Triumph motorcycle company's TT-winning 600cc machine being summarily chopped into four pieces by one of Lord March's gateposts. But we won't dwell on that, because the only nose that was really put out of joint was Mr Whitham's, and everybody is more than happy to have the chap back again. 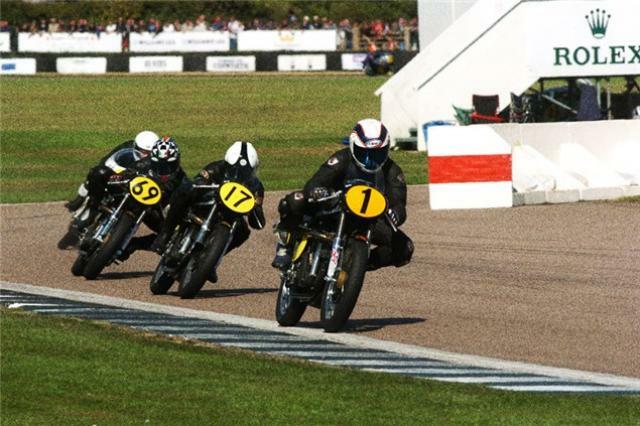 Indeed he is essential, for the last two years it is young Whitham who has taken the fight to that colonial cove Mr Wayne Gardner in the Revival weekend's motorcycle races. A tussle that has always raised the pulses around the track as well as on it. Before we open shooting sticks, fill hip flasks and settle ourselves down to watch the racing, for the benefit of those of you who have been serving overseas with your regiment or have perhaps been tending to your tea plantations, I will now take the opportunity to tell you a little about this fine event. A racing circuit was established at Westhampnett aerodrome three years after the last big show (although we don't, of course, like to mention the war) and was used for racing for another 20 years. Mostly the races were for motor cars driven by aces such as Stirling Moss, Graham Hill and dashing foreign johnnies such as Juan Manuel Fangio; but motorcycles also raced there. 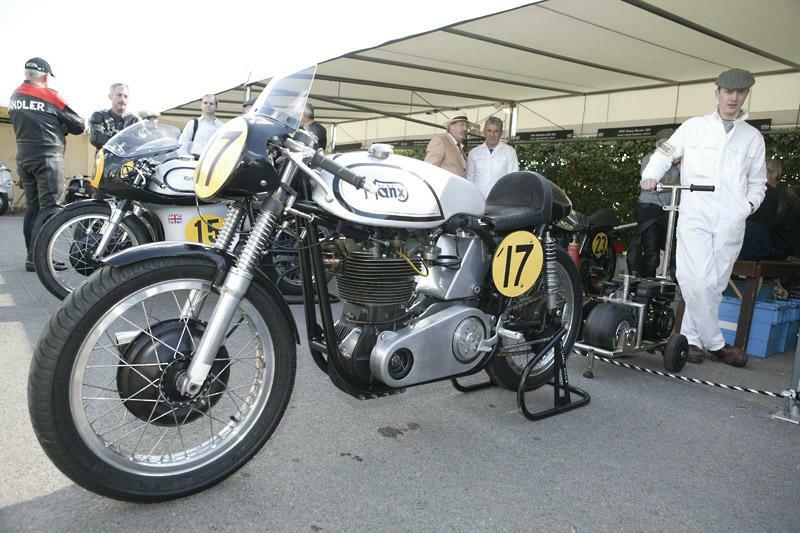 From '67 Goodwood was used only for testing, but in '98 Lord March (after much to-ing and fro-ing with wheelbarrow loads of dirt to build earth ramparts so that the people in the village nearby didn't have their naps disturbed by the noise of racing machines) announced the inception of the Goodwood Revival road races.